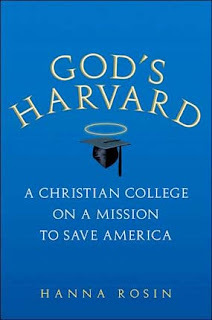 stylos: Book Note: "God's Harvard"
Hanna Rosin, God’s Harvard: A Christian College on a Mission to Save America (Harcourt, 2007): 296 pp. I picked this book up for cheap at the Green Valley Book Fair a few weeks ago while we were in between one of Sam’s baseball games over in Mt. Crawford. Hanna Rosin is a Jewish journalist who covers politics and religion for the Washington Post. Her book was written after c. a year (2006-07) spent with open access to the students, faculty, and staff of Patrick Henry College in Purcellville, Virginia. Patrick Henry is a small Christian college that primarily enrolls high-achieving students from homeschooled families. 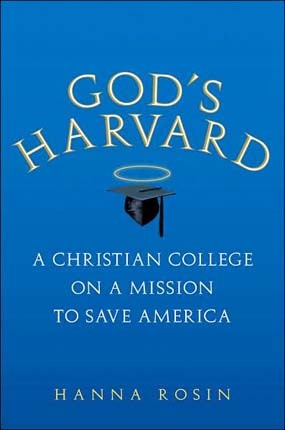 The school was founded in 2000 with the aim of creating a Christian alternative to the Ivy League. At the time the book was written—during the Bush administration—there were a disproportionate number of Patrick Henry students filling much coveted internships in the White House and throughout the corridors of power in Washington. Her book offers a glimpse into the world of the conservative Christian students at Patrick Henry and various aspects (e.g., courting, modesty issues, conservative political activism, etc.) of the “Joshua Generation” (i.e., second generation) of the evangelical homeschooling subculture. Rosin is generally sympathetic in her portrayal of Patrick Henry students and faculty. She is less sympathetic in her portrayal of Patrick Henry founder and then President Mike Farris. During the course of her year at the school, there was a major internal disruption and nine of the faculty resigned in a conflict with Farris (who since transitioned to become the school’s chancellor). It sounds as though at least part of the issue was Farris’ aversion to the Calvinism of some of the faculty. One of the insights of the book, intended or not, is that there are always problems when one attempts to create a Utopia. Patrick Henry was founded as a Christian College with a strict student code of conduct, but faculty, students, and staff are all sinners. College students—even those raised in strict Christian homes—sometimes drink beer, watch restricted movies, and break the rules. Faculty members test the limits of academic freedom in a confessional school. Administrators act boorishly. Sinners act sinfully. Again, that is far from the main point of the book, but it is one message that speaks clearly.